CHECK EMPLOYMENT NEWSPAPER GULF JOBS – DREAM BIG A Reputed largest OIL & GAS – GAS OPERATIONS Company in the world requires for long Term Employment in Saudi Arabia. Candidates who are seeking for the EMPLOYMENT NEWSPAPER GULF JOBS CAN also check the details of LATEST GULF EMPLOYMENT NEWS PAPER INDIA Job vacancies that have been posted recently. Here we are Updates the Complement details of the Job recruitment like Job position, No. Of vacancies, required Experience, Qualification Etc.., The Company is providing FREE RECRUITMENT FOR ENGINEERS. Last day of CV Submission is 30th April 2017. Contract Adviser required 10 Years of Experience Qualification required For this Job vacancy is BBA. Maintenance Engineer- Rotating Required 10 Years of Experience, Qualification BE Mechanical. LATEST HUGE EMPLOYMENT NEWSPAPER GULF JOBS – Mechanical Engineer – Static required 10 Years of Experience, Qualification BE Mechanical. Process Automation Network (PAN) System Administrator required 10 Years of Experience, Qualification BCA / MCA. For More LATEST HUGE EMPLOYMENT NEWSPAPER GULF JOBS Check the details of LATEST GULF DAILY NEWS CLASSIFIED JOBS vacancies in this Site. Mechanical Engineer-Rotating required 10 Years of Experience, Qualification BE Mechanical. Chemical Engineer required 15 Years of Experience, Qualification – BE Chemical. Plant & Equipment Welding Inspect required 09 Years of Experience, Qualification BE Electrical or Mech. Safety Coordinator required 7 Years of Experience Qualification BE Chemical. 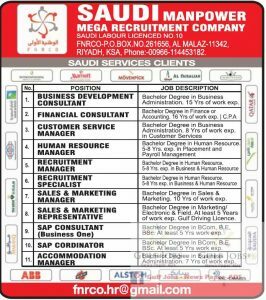 NEW EMPLOYMENT NEWSPAPER GULF JOBS – Candidates worked in Saudi Arabia need not apply unless they have NOC & Final Exit OR Should have 2 Years gap leaving KSA Graduation Should be full Time. Interested and Eligible Candidates can apply for this recruitment . Candidates can Send their CV to the Email ID : www.Jerryvarghese.com/applyonline. Jerry Varghese International Ltd, 206 Gateway Plaza, Hiranandani Gardens, Powai, Mumbai- 400 076. Tel: +91-22-67241611 / 633 / 670 / 658. For More NEW EMPLOYMENT NEWSPAPER GULF JOBS can check the recently Posted Job recruitment’s. 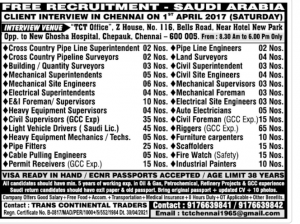 LATEST EMPLOYMENT NEWSPAPER GULF JOBS:.